Disclosure: I was provided paint and supplies from DecoArt, but as always all ideas, thoughts, and opinions are all mine. 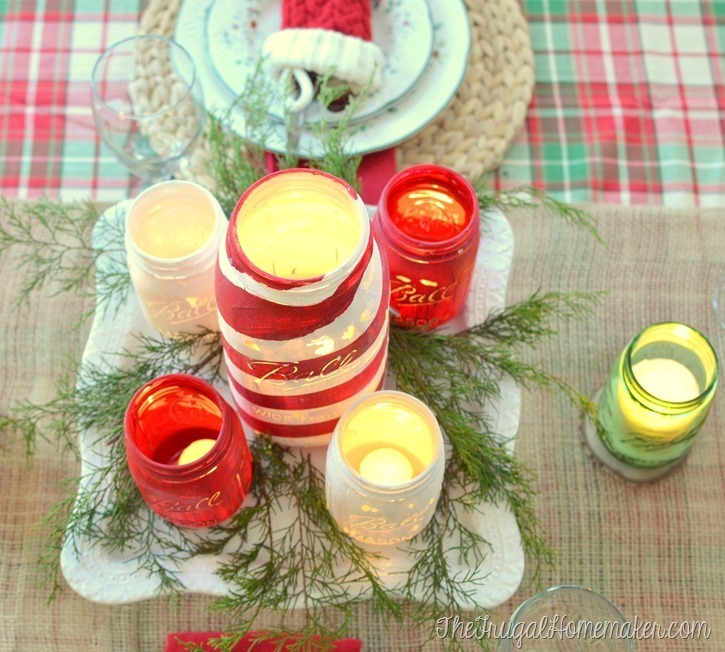 I am excited to share a bit of my Christmas kitchen and a Christmas tablescape with you today. I have been up to my elbows (literally!) in paint, stain, ribbon, and greenery and can’t wait to show you all of these projects in the next few days before Christmas. So let’s step into the kitchen and take a peek at my table all decked out for Christmas. I had such fun putting this together by pulling things from around the house most of which weren’t even specifically Christmas. 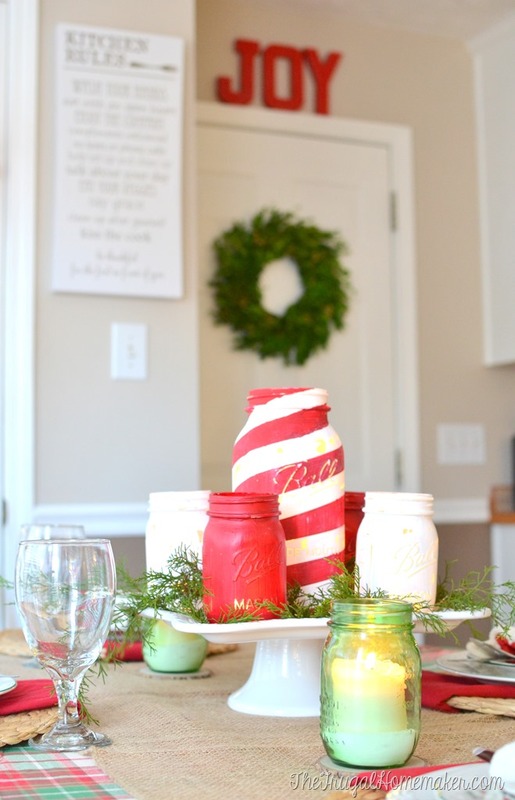 But just add some greenery, candlelight, mason jars, my Christmas dishes and it all comes together. How have I made it this far without painting a mason jar I don’t know… I mean, I decorate with them, store things in them, make them into soap dispensers, give them as a gift container, use them as candleholders, even eat and drink out of them, but I have never painted any. BUT thanks to some fun Chalky Finish paint from Americana Decor I finally have some painted mason jars and I LOVE them! I have been wanting to try out chalky finish paint for a while. 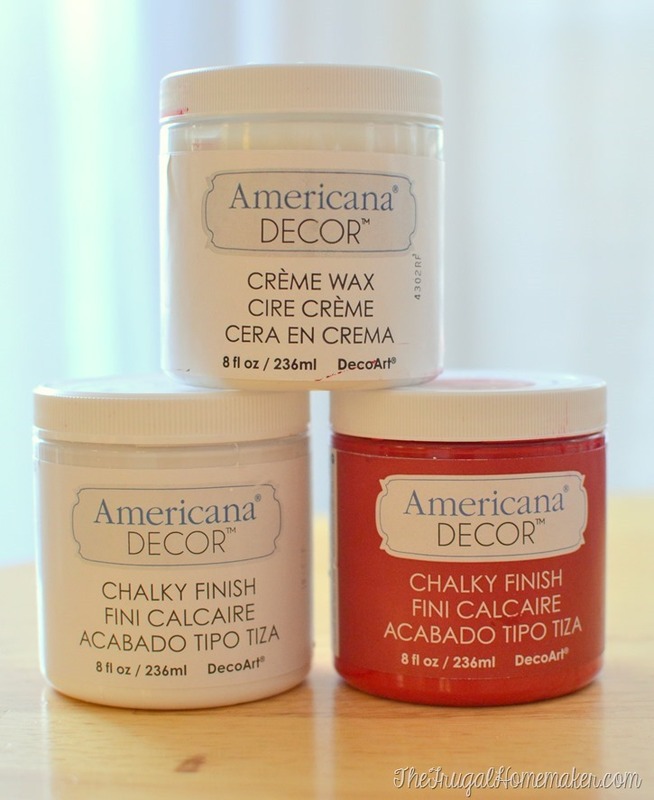 It was easy and a lot of fun to use and I will definitely be doing some other craft ideas using this chalky finish paint. 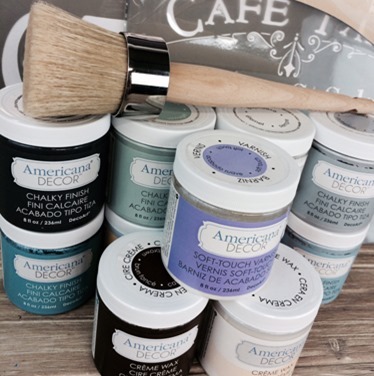 Americana Decor Chalky Finish paint is available in Michaels in the wood and finishes aisle along with brushes, waxes, and anything else you may need. Visit the DecoArt Chalky Finish website for more chalk paint ideas and inspiration. 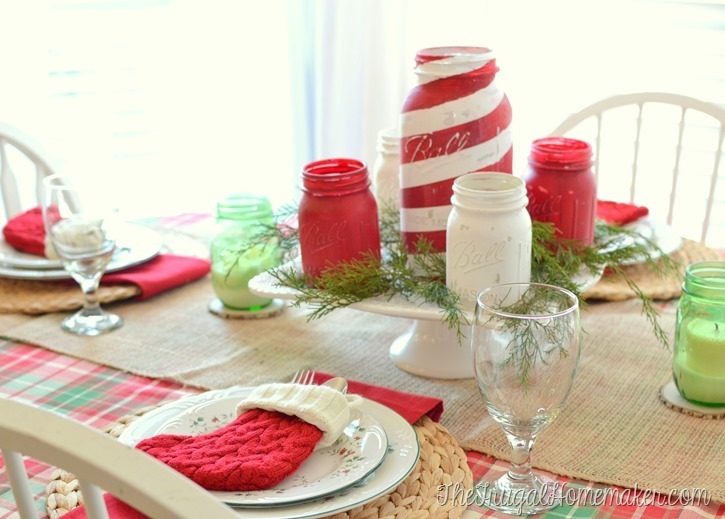 I used Americana Décor paint in Everlasting (white) and Romance (this was the perfect red color!) and also finished it with some Crème Wax. 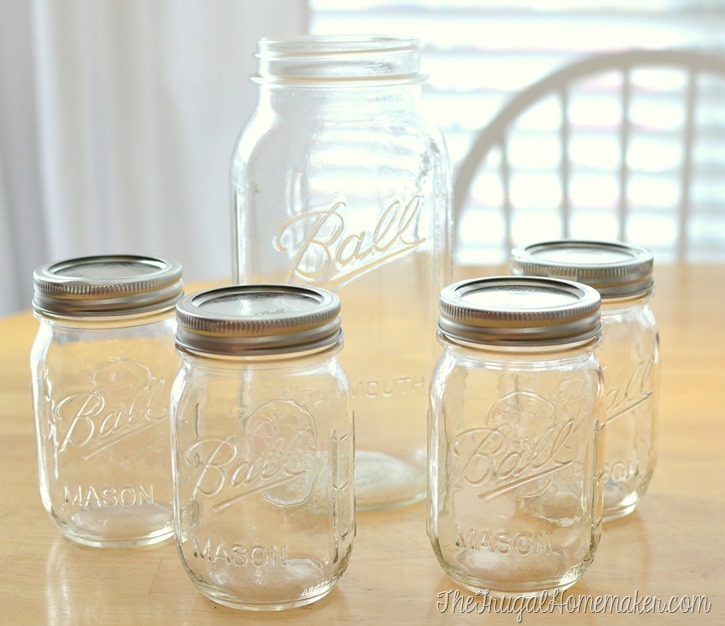 I also picked up these Ball jars from Michael’s on Black Friday – I went ahead and bought a box of the small jars since I plan on giving some jars as gifts. And I just love that big Half Gallon jar! I painted all of the jars with 2 coats of paint – this was after 1 coat. You could even do a 3rd coat if you wanted. It dries fast – I waited 20-30 minutes between each coat. The fun part about chalky finish paint is it is specifically made for that vintage, distressed look. You don’t HAVE to distress or sand but if you want to this paint is perfect for that. Once the jars dried I took my sanding block to them with some medium fine sandpaper. I love seeing the Ball label peaking out from the paint. You can sand and distress as much or as little as you want. I had something special planned for the large jar. 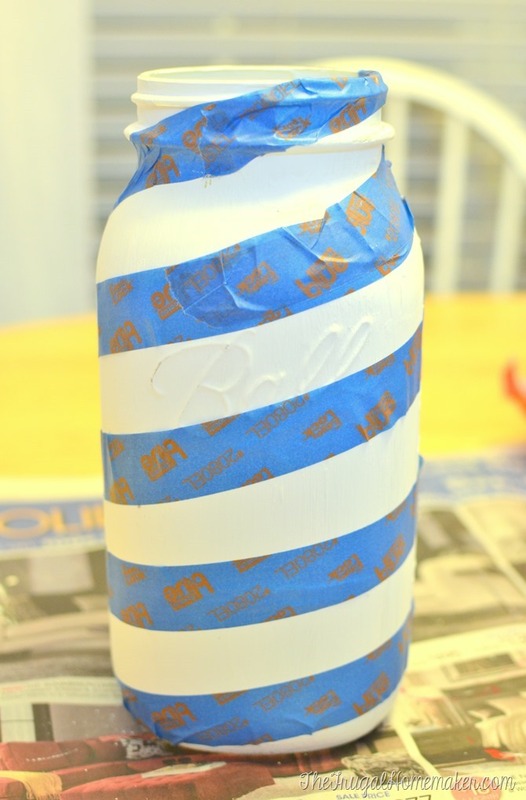 Once it was fully painted with the white paint I taped off stripes with some thin Scotch Blue painter’s tape. I made sure to use the delicate tape that was for freshly painted surfaces. Then painted red stripes! You may have to touch up a bit after taking off the tape as taping off a round surface with bumps and ridges can be a bit tricky but I was pretty happy with the crisp lines. But if you are going to distress it anyways, it doesn’t have to be perfect. I finished them all with some of the creme wax and buffed it to a matte finish. 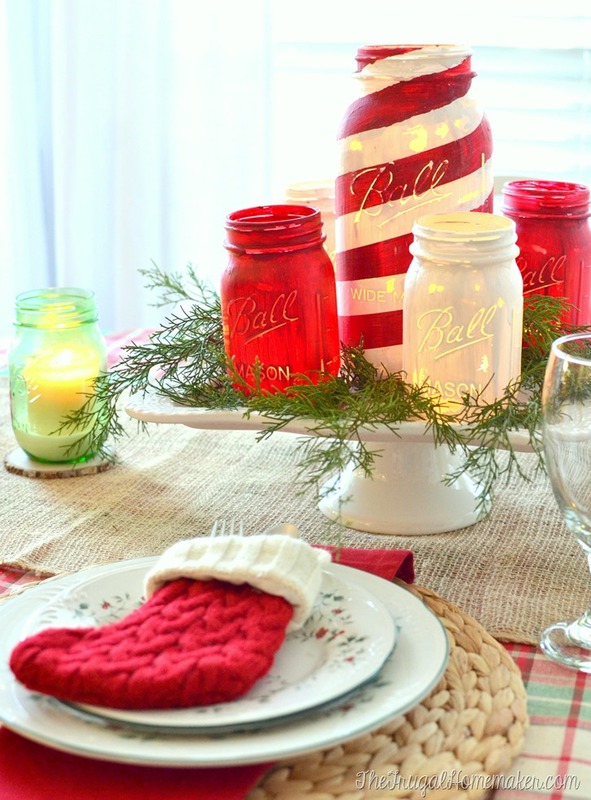 Add candles or whatever you wish and you have some fun Christmas mason jars perfect for a centerpiece, mantel, or anywhere you want to use them. These would also be fun gifts. I just placed them on top of a white cake plate and tucked some greenery from the backyard around them. I couldn’t be happier with this fun centerpiece. They would be fun to use for Valentine’s Day or even 4th of July too. I love how the candlelight shines through all the distressed areas and the label on the jar. 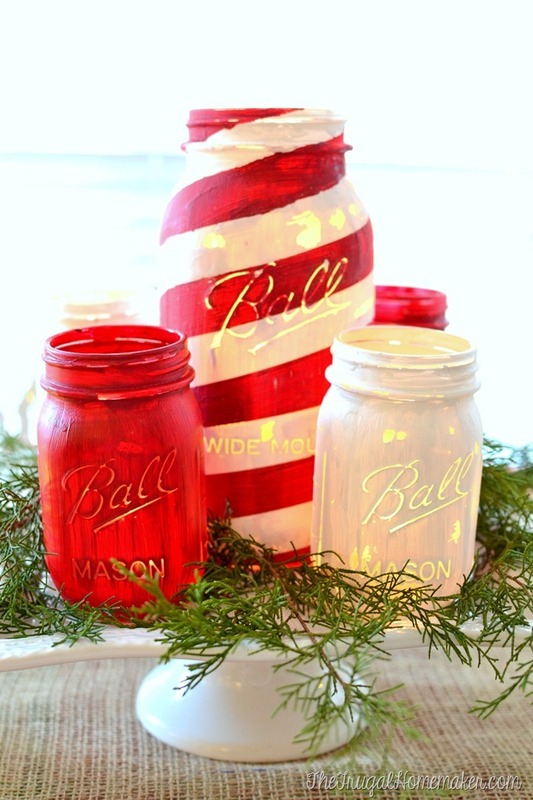 I really wanted to bring vintage décor into my Christmas decorating this year and these Ball jars painted in a fun finish are so perfect. Here they are without the candles lit – they are pretty either way! I just love the beauty and magic that Christmas lights bring during December! Now I have something super fun for YOU! How would you like to try out some Americana Décor Chalky Finish paint? One of you is going to get a prize package full of all kinds of goodies from Americana Decor. Using the rafflecopter widget below, enter for a chance to win 8 colors of your choice, clear and dark creme waxes, Soft Touch varnish, waxing brush, and 2 stencils of your choice *. Giveaway ends Monday, December 16th at midnight and winner will be notified by email. * The items pictured are representations only. The stencils and paint will be selected by the winner. 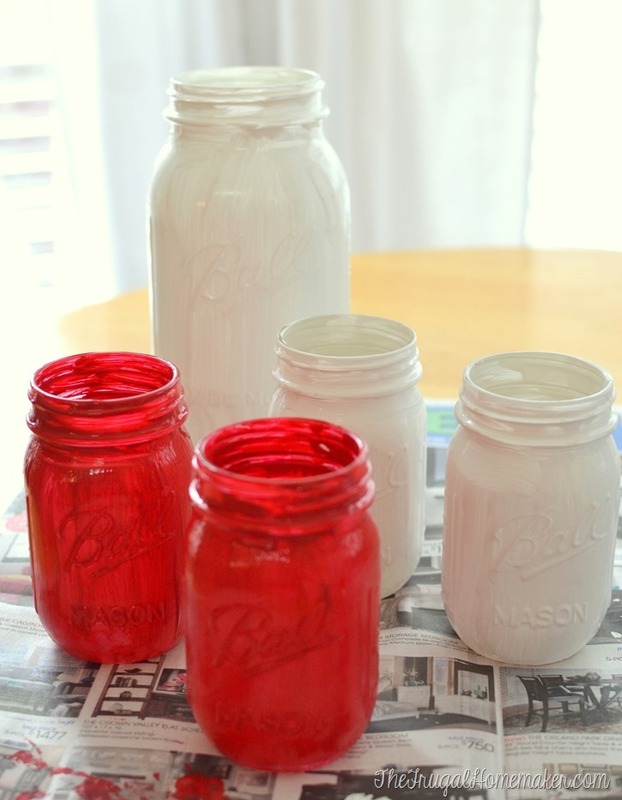 Have you ever painted mason jars or tried Chalky Finish paint? 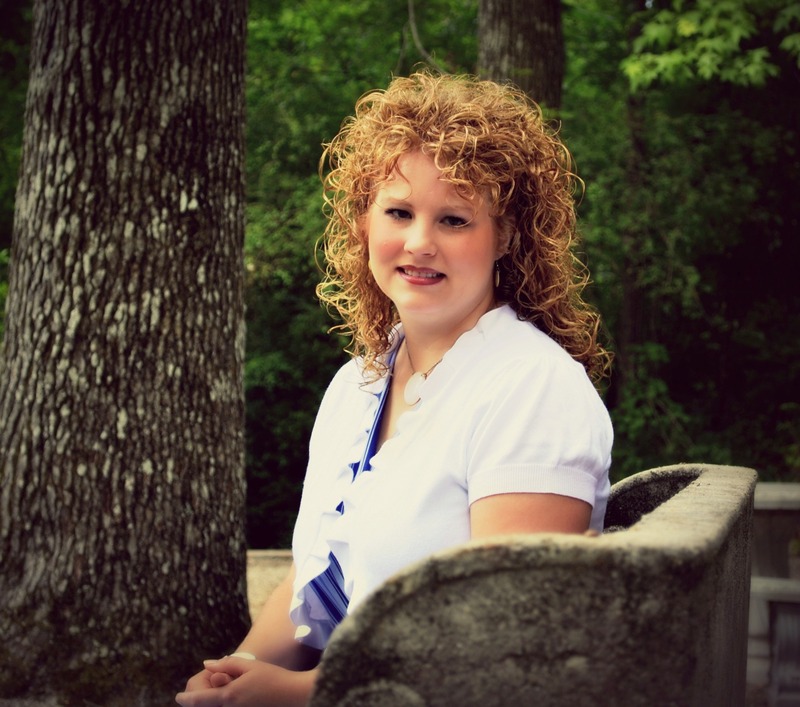 Follow Christina@TheFrugalHomemaker.com’s board Frugal Homemaker Christmas on Pinterest. 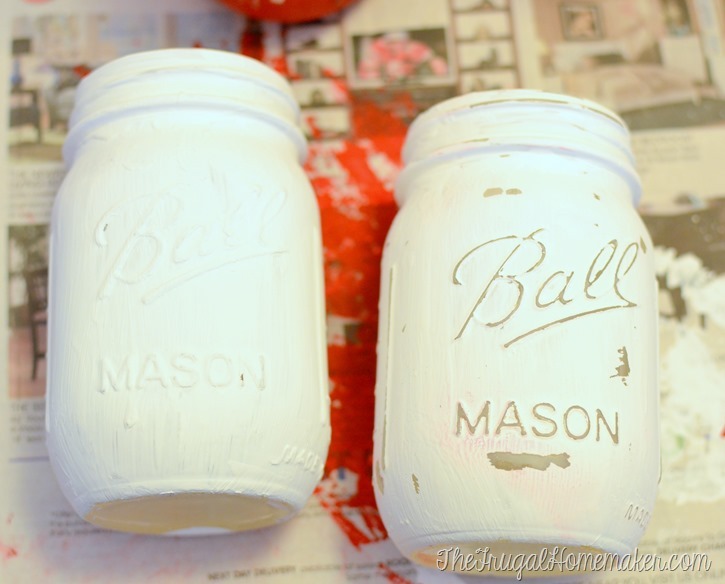 I love how your Mason jars turned out – I would love to be the lucky winner to try out the chalky paints! 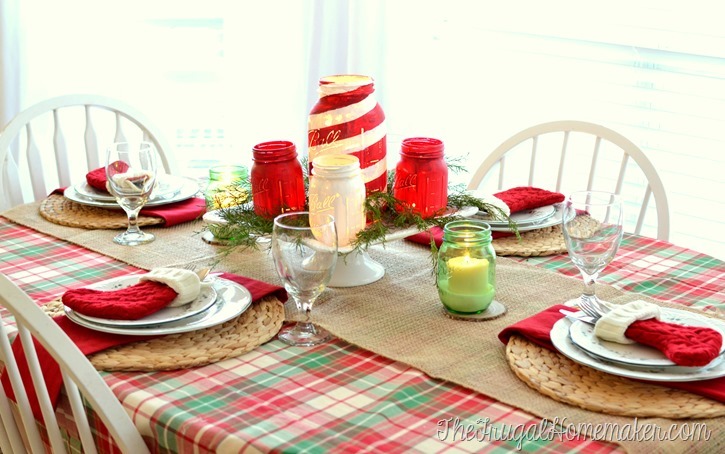 They looked so pretty with your Christmas table setting…. Thanks for sharing – looking forward to more of your Christmas decorating posts! I love these mason jars. They are so pretty and festive. Cool idea! I do think you could use your jars for Valentine’s Day also. Hi Christina! What a gorgeous table. I love vintage jars. 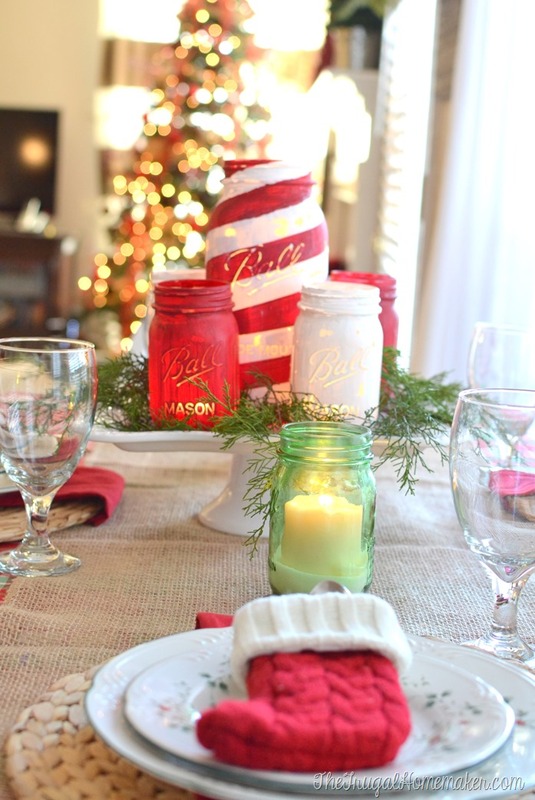 Never thought the jars could be so Christmasy! I would love love love to win the paint. My kitchen is already red so I’m halfway there! Thank you so much for sharing all your ideas. God Bless! This is my fave chalk paint! I LOVE it! I hope I win this! These jars are so cute. The perfect Christmas accent. 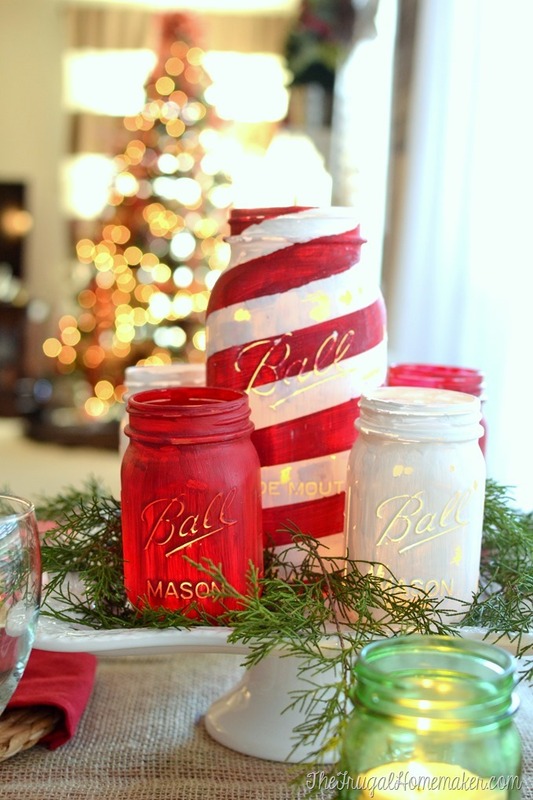 I have not painted mason jars but I can see it as a craft after Christmas. ….white for winter, snow. Pick me! Love, love, love!!! Could really use some of that fun paint for a million projects???? Great craft! I tried chalk paint once, but want to try it again! Great idea and inspirational! Hope to make my own set. I just purchased my first bottle of Americana Décor Chalky Paint to paint my grandson’s recycled dresser. He chose a really pretty blue and I am anxious to get started. Would love more colors to try on a boatload of other projects I would like to do. I just love how your table looks. 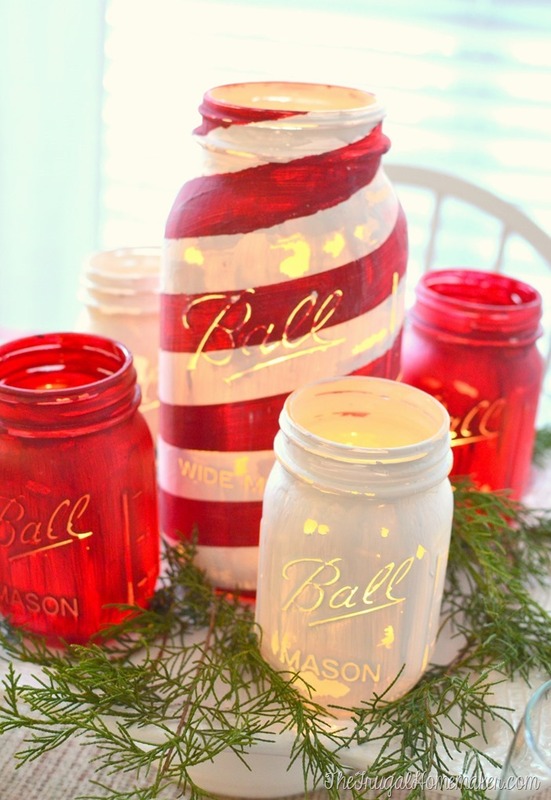 I have never tried painting Mason jars but love the look. The painted stripes look so festive! 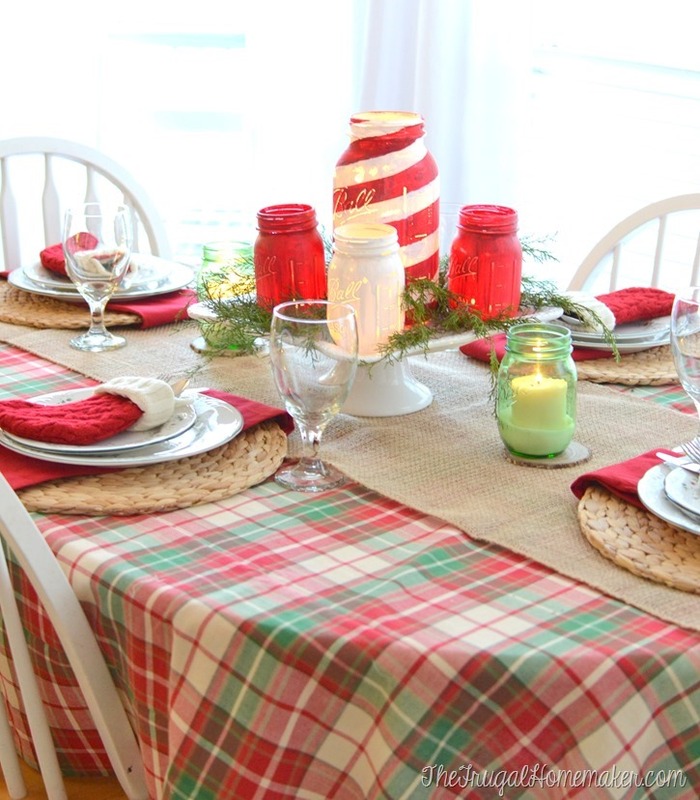 Your plaid table cloth is the perfect background for your great centerpiece! I’ve never painted mason jars or used Chalky Finish paint but I have always wanted to try chalk paint so I hope I win! I love this idea! Your tablescape looks so neat! 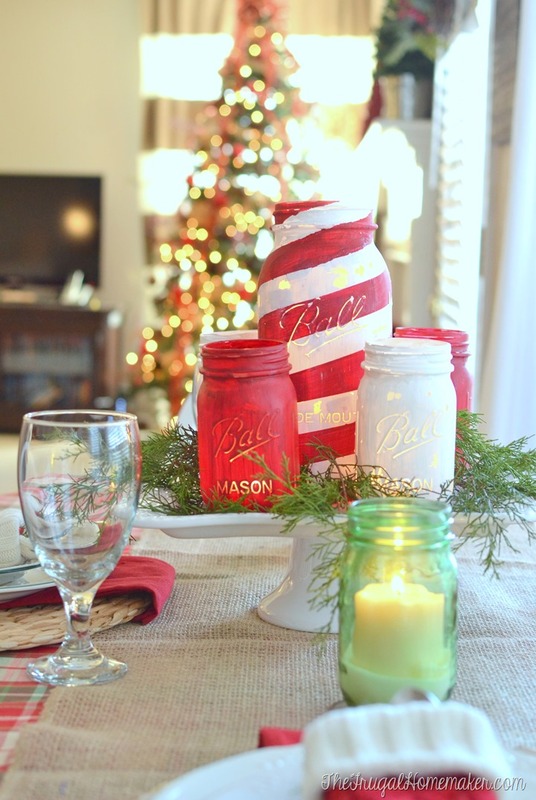 I love the plaid, burlap and canning jars together. 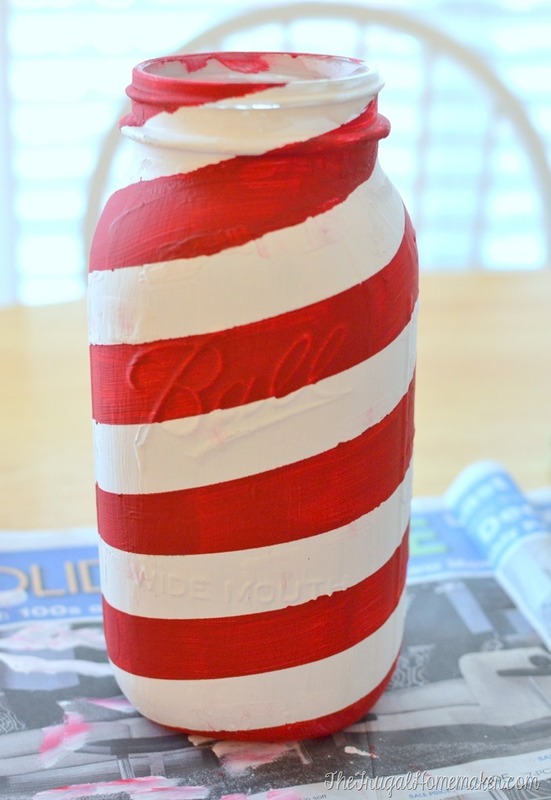 Cute ideas, and what a fun and creative gift….. hope I win! I’ve never painted Mason jars either. Yours turned out super cute! 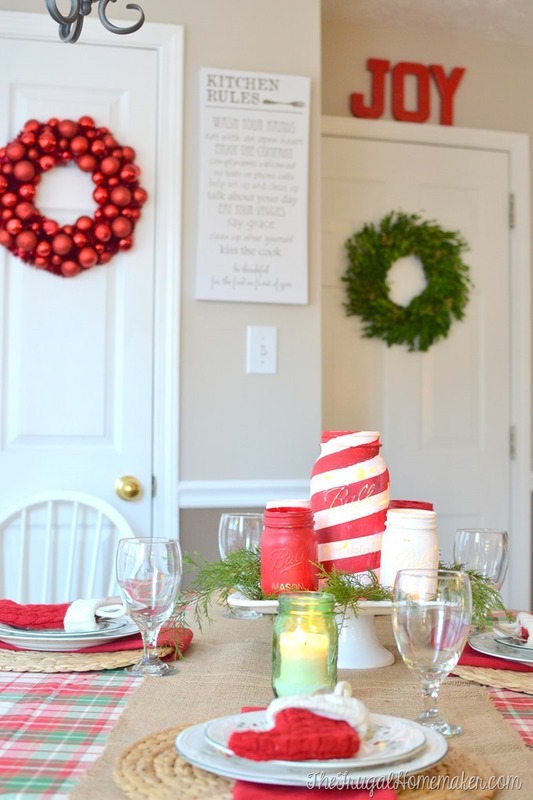 What beautiful Christmas decorations, and your table is really lovely! I just got a bunch of jars! I definitely going to try this! I keep seeing so many wonderful projects using Chalky Finish Paint but have never tried it. This is the perfect opportunity. Your mason jars turned out cute and with so many different colors to choose from the possibilities are endless. Thanks for the chance to win! Love these jars and the colors of paint. I’m a traditional girl when it comes to Christmas and these are just my style! I love how the jars turned out! I will have to add this craft to my list of crafts to do. Beautiful! What an awesome centerpiece. Very festive!! I use all my jars for canning but I might have to get some for some altered projects this is neat. What a wonderful centerpiece! I really love the chalk paints. I love your blog, your FB posts, your mason jars, but Raffle Copter I just don’t really understand. Oh I am so sorry, Vicki! Can I help you with something with it? If you have facebook – just click on login with facebook and then click on the first line (which I think for this one is to leave a comment) and click I commented. How do I register to win the Chalk Paint and ball jars? I would like to make some to give as gifts this year.